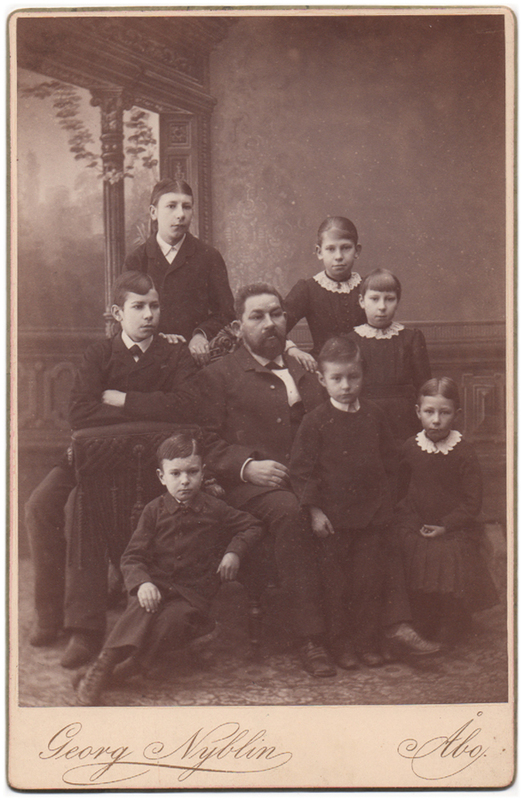 A photograph of a man, sitting, surrounded by seven children of different ages. Once you begin looking at their faces, some similarities in their looks become apparent: many of the children have the same ears and the nose as the man in the picture, which leads to the presumption that he is the father of the children. The children’s mother is not portrayed here – perhaps she was no longer alive when the picture was taken. The photograph was taken in Turku, Finland, by photographer Georg Nyblin, likely at some point during the 1880’s (or perhaps early 1890’s? ).